It certainly looks like it, according to the latest, publically available version of the Eldon Square South letting plan. [broken link removed] What’s more, it also appears that there’s going to be a branch of the trendy fashion brand of the moment, Superdry. At present, the only Apple Stores in the north of England are in Manchester (Trafford Centre and Arndale Centre) and at Sheffield’s Meadowhall. If it all goes through, Apple Store coming to Newcastle would therefore be a real coup for Eldon Square’s majority owners, Capital Shopping Centres (CSC). Indeed, Apple Store and Superdry are particularly welcome additions to Eldon Square in that they are retailers new to Newcastle (though Superdry, admittedly, already has a store at Gateshead’s MetroCentre). 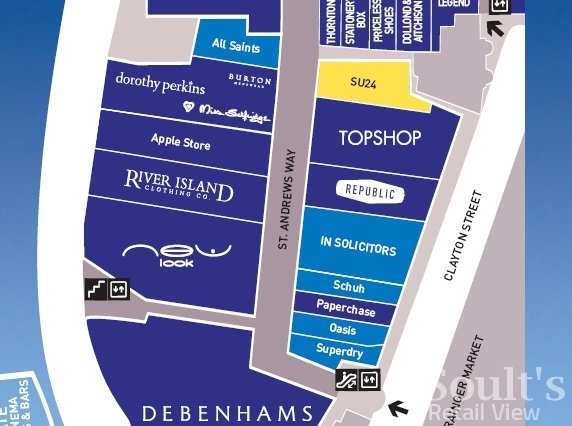 As I noted before, with the exception of Debenhams, ES South’s early major lettings – New Look, River Island, the Arcadia brands – were all relocations from existing pitches in Eldon Square. Back in June, this lack of new names led the retail industry journal Retail Week to devote an in-depth – if perhaps overly negative – article to what they described as CSC’s “hollow victory”. However, this latest news on lettings begins to suggest a better balance between old and new names, as well as indicating that there are only six of the 25 new units left to fill. This raises the prospect that ES South could, when it opens next spring, be more or less fully let – a remarkable achievement given the present economic climate. The real test, however, will be ensuring that the large and prominent units being vacated by New Look, River Island, Topshop, et al do not stay empty for long. Credit where it’s due to patrickratcliff at the SkyscraperCity forums for spotting this interesting new development! Previous story How many former Woolworths can Graham visit in one day?